View cart “The Alaska Chronicles by Miles Nolte” has been added to your cart. At age fifteen, Martin “Donny” Donovan graduated from Testwood School in Southampton, England and set out on a ten-year odyssey of traveling the world, working odd jobs, and pining for an eventual means of returning home to the chalkstreams where he fished and explored as a child. Through connections and persistence he eventually worked his way into the exclusive niche of riverkeeping and landed a job working the Nursling beats on the famed River Test. 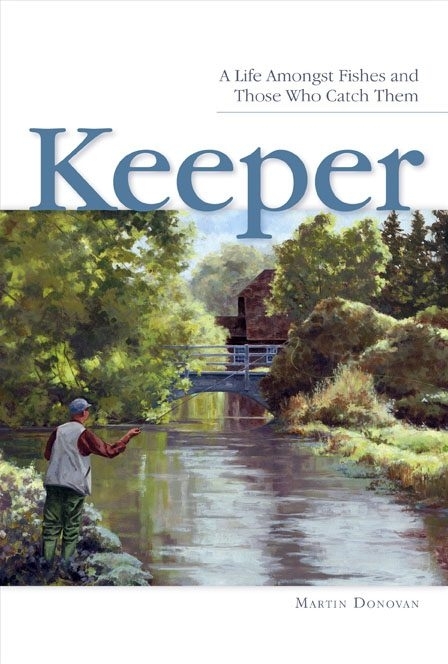 Keeper, is Donovan’s rollicking account of his antics abroad, and two decades of tending rivers, coddling fish, and guiding anglers. His stories are exceptional, but what ultimately sets them apart is Donovan’s wry voice and his bracing departure from the stereotypical English fly-fishing memoir. With equal measures of passion, irreverence, and hilarity, he does a masterful job of salting a traditional setting with an oddball cast of characters, props, and predicaments. He introduces us to gentried English dry-fly purists and mobs of bait soaking carp-catchers. He writes about prominent London attorneys, cantankerous skinheads, redneck clock peddlers, and booze-swilling farmers. While fly-fishing for trout and salmon are Donovan’s beloved diversions, he also has an eclectic fixation with derelict motorbikes, chainsaw carpentry, hitchhiking, canned beer, and curry houses. While some angling traditionalists may lament that all of the great stories have long-since been written about the English chalkstreams, we are proud to present an engaging addendum and a fresh new voice from the birthplace of fly fishing. After eleven years of working as a riverkeeper on the Lower Test at Nursling, Donny moved his wife, three children, and two dogs to the headwaters in the spring of 2010. He now keeps the Whitchurch beat, a quiet and scenic stretch of the River Test with lots of rising trout, comparatively few poachers, and an owner who shares Donny’s passion for the river and the fish. Having never completely shaken his wanderlust, Donny still travels abroad with his family, and he sneaks a fly rod along whenever there are fish within range. In recent years he’s fished in Cuba, New Zealand, and the West Indies, but his true passions will always be Atlantic salmon, wild brown trout, and the health of the English chalkstreams.